No wonder he’s so adept at getting past defenders. According to Patric Bach and Steven Tipper of Bangor University, the mere sight of Wayne Rooney inhibits the control you have over your feet. Apparently, looking at Rooney automatically triggers football-related activity in the movement control parts of your brain, leading to the paradoxical effect of impairing your own foot control. By contrast, Bach and Tipper found the sight of the British tennis player Tim Henman impairs your hand control, but not your foot control. Forty student participants were shown photos of the footballers Wayne Rooney and Michael Owen and the tennis players Tim Henman and Greg Rusedksi. None of the photos were action shots, but half showed the sportsmen in a sporting context whereas the other half showed them off-pitch, or off-court. The participants’ task was to identify as quickly and accurately as possible the sportsman currently displayed, using either a keyboard key or a footpad. For example, during one trial the participants were required to press the footpad if the computer screen showed Rooney but to press the spacebar with their finger if the photo was of Henman. On another trial the means of response was reversed so that the footpad was used for identifying Tim Henman, with the keyboard used for Rooney. Hundreds of such trials were performed. The crucial finding is that on average the participants were slower (by about 20ms) and less accurate at identifying the footballers when using their foot compared with their finger. By contrast, they were slower and less accurate at identifying the tennis players with their finger than with their foot. These effects were actually slightly greater when the sportsmen were shown out of a sporting context. “Perceiving a highly skilled athlete inhibited similar motor behaviour in the observer”, the researchers said. The finding suggests that “people use their own action system to represent knowledge about other persons”. 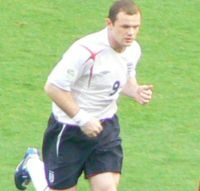 In this case, the participants represented the motor skills of Rooney and the others, even though they weren’t observed in action. The findings are consistent with earlier research showing the sight of Albert Einstein impaired people’s subsequent performance on an IQ test. Bach, P. & Tipper, S.P. (2006). Bend it like Beckham: Embodying the motor skills of famous athletes. The Quarterly Journal of Experimental Psychology, 59, 2033-2039.